Tripp Lite's P137-06N-DVI-V2 Min-DisplayPort v1.2 to DVI Active Adapter Converter allows you to connect a computer with a Mini-DisplayPort (or Thunderbolt) port to a DVI monitor. 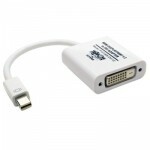 Ideal for displaying video on a large monitor or digital sign, this adapter supports high-definition video resolutions up to 1920 x 1080 (1080p). It converts both Single-Mode and Dual-Mode (DP++) Mini DisplayPort output, and is perfect for use with graphics cards, such as AMD Eyefinity, that do not output DP++ signals.